You've heard the saying, "Sticks and stones may break my bones, but words can never hurt me." The message is supposed to empower children to realize that even though someone can hurt them with physical force, someone cannot hurt them with words. We hear the same idea in the song called "Titanium." The singer says, "I'm bulletproof, nothing to lose. You shoot me down, but I won't fall. I am titanium." It sounds good: Your words can't hurt me. But I'm above that. I'm untouchable. I'm titanium. This week the big national sports story has been about some football players for the Miami Dolphins. A player named Jonathan Martin left the Dolphins' cafeteria one day last week during lunch, after he was the target of a prank. Martin is in his second year with the Dolphins, and he's a starting offensive lineman. So when the team had a game on national television last Thursday night, fans who watched the game were wondering: Where is Jonathan Martin? He wasn't there. When he left the cafeteria, he also left the practice facility, and he didn't show up for the game. He went to seek help for "emotional issues." When I first heard the story I thought that sounded a bit much for a little lunchroom prank in which none of his teammates would sit with him. He's a big man (6'5", 312 lbs. ); he should be able to take it. He knows how to take a hit on the field, but he can't take a joke in the lunchroom? But he didn't leave the team just because he was embarrassed by the prank; he left because of the bullying, hazing, and harsh words from one of his teammates. According to the latest reports, a player named Richie Incognito had been sending him threatening, racially-charged text messages and voicemails. 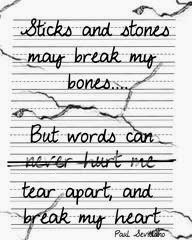 Is it true that sticks and stones can break your bones, but words can never hurt you? And if you're being bullied or intimidated by someone, you need to tell someone: a parent, a teacher, a coach, a counselor, a pastor...someone. Don't let it go on another day. But long before the news reported the story about the power of words in the Miami Dolphins' locker room, the Bible was teaching that words have extraordinary power. The book of Proverbs in the Bible is filled with helpful wisdom that has stood the test of time. It says, "The tongue has the power of life and death" (18:21a NIV). When the Bible uses the word, "tongue" here, it's talking about our speech. It's talking about words. The words you speak can build a person up or they can tear a person down. A hammer can be used to build a birdhouse. But a hammer can also be used to smash a birdhouse. The words you use to parents, to teachers, to coaches, to teammates, and to classmates, carry with them the power of life and death. to build each other up, not to tear each other down. It's the picture we have in Ephesians 4:29, where we're told, "Don't use foul or abusive language. Let everything you say be good and helpful, so that your words will be an encouragement to those who hear them" (NLT). Does that describe the way that you use words? You will thrive, your families will thrive, and your relationships will thrive if you would use your words to bring life to others and not death. Pumped Up Kicks in Newtown, CT?